investment your company makes this year. Enhance your safety program with this crucial video that could save lives. Vehicles are involved in accidents everyday and they can usually be prevented. When a driver is trailer towing, they are even more likely to be involved in an accident. 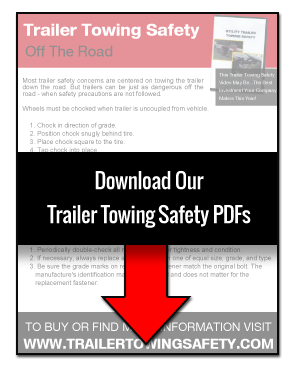 However, you can prevent your drivers from getting involved in an accident by simply purchasing this Trailer Towing Safety Video and showing it to your employees. The most common problem drivers have with trailer towing is inexperience. Drivers do not require any special license or certification to tow a trailer, but maybe they should. Anyone can attempt to hook a trailer to their vehicle and set off on their way. That’s when the problem arises. Many people think they can drive the way they normally do with the trailer attached to the rear of their vehicle. However, that is not the case and this usually leads to accidents with serious repercussions. Our safety training video helps eliminate problems many drivers have with trailer towing. If you own a company and you have noticed an increase in accidents when your employees are trailer towing, this safety training video is the best investment you will make in your safety program this year. By teaching your trailer towing staff the right way to tow a trailer, you could be preventing dozens of possible accidents as well as possible losses in merchandise, insurance claims and injuries to your employees and/or other drivers on the road. Click here to learn more about the Trailer Towing Safety Video. A few years ago, Ohio Concrete had a problem with accidents when their employees were trailer towing. It was important for us to address this problem when we realized it was a training issue and could be eliminated with this safety training video. Many of our employees had little experience hooking up, backing and driving with trailers. We searched libraries and the internet and could not find solid information discussing this topic, so we produced a safety training video ourselves with the help of an experienced video production team. This Trailer Towing Safety video has eliminated our problems and accidents due to inexperienced drivers trailer towing improperly. Order your safety training video today and start saving. responsible for all shipping and customs charges.